Defender is one of the all-time classic coin-op games, with a legend that remains strong even 20 years after its release. 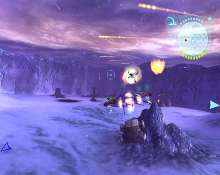 This long-awaited PS2 update mixes the classic gameplay of the original, and takes it into full 3D with all-new elements such as mission-based play and gives the player more elaborate weapons. Defender also gives players enhanced abilities and weapons, but there are smarter enemies that make it even more intense. Despite all these changes, Defender remains as addictive, fun and frenetic as the original. We happily blast away and explain why this classic update is a must-buy. Taking the essence of the arcade classic and expanding on it with mission-based play and a complete 3D overhaul, Midway's Defender is an incredibly successful update to the series. The main objective still involves rescuing colonists from being killed and mutated by the evil enemy, an alien race known as the Manti. If a colonist is captured by a Manti Lander, you have to destroy their captors before they are killed. Once this happens, the invader is turned into an incredibly dangerous mutant who is much more aggressive than the standard Landers. Defender changes the save and rescue mechanics because the colonists can are only safe when them off in designated areas, instead of anywhere on the level. There's more to the game than simply rescuing humans from the hordes of alien invaders because Defender has mission structure with different objectives and, each mission may be divided into several sub-objectives. This new approach works seamlessly with the conventional Defender elements because it makess things more challenging. This structure adds to the gameplay's variety, intensity and challenge and also keeps things from getting dull. Some objectives require you to defend bases, bridges and factories from attack while simultaneously battling the Manti swarms. The enemy forces have more variety in them now, and in addition to landers, you'll face deadlier foes including stingers and ground based Manti enemies such as the devastating spiders which are very difficult to take down. Since these ground-based elements offer ground support, placing them correctly is important. You'll come into contact with some intense boss characters every few levels, destroying these is incredibly difficult. While the early training missions are a bit slow, things pick up in a hurry. While Defender veterans will probably be disappointed that the action isn't immediately incredible, the later missions match the original game's furious pace. There's sheer number of enemies on the later levels is impressive and there's nothing quite like the adrenaline rush that comes in seeing the massive swarms of enemies coming right at you. 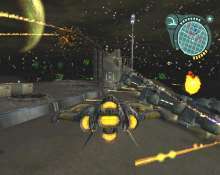 Unlike the single ship available in the original game, there are 6 different ship types included in Defender, you start with 2 and can unlock new ones as you complete missions. You can also switch from standard to more advanced weapons during the battle. Each ship has it's own strengths and weaknesses in speed, armor and firepower. These can be upgraded with additional weapons and abilities between rounds with weapons that include standard blasters, lock-on missiles plus the famous area-clearing Smart Bombs later on. 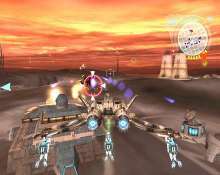 They are quite versatile and powerful and can perform a variety of moves such as barrel rolls to evade enemy fire. You can also swoop down on the ground ships can also carry items like missile launchers and power-supplies around each level and drop them off in another location. You can also grab power-ups by shooting crates and grabbing the health-packs they release. These new collecting and placing gameplay elements are smartly designed and add to the strategic aspect immensely without making losing Defender's essential appeal or intensity. Defender starts off relatively with a relatively simple approach, but the game gradually adds more tasks, types of enemies and challenges until the missions become almost overwhelming. More intelligent and dangerous Manti-types appear as you progress and the other types become more belligerent. Between watching the invaders and making sure that you keep the important things safe, you need to stay aware of the big picture. Forgetting about that transport on the other side of the mission area isn't a good idea. One of the most important elements that made the classic Defender so timeless was its risk vs. reward system. You had to decide whether rescuing a human was worth the risk of losing your life. The new Defender is cool because it retains this with higher stakes since you receive ship upgrade credits for each saved colonist. Unlike the original game, points are deducted from the total score when colonists are killed. You have to worry about other things and with so many things going on at once, it's not always possible to save all the colonists, so you're forced to choose where to concentrate. Remember, the captured colonists become mutants, so you're basically penalized twice if you fail in defending them. The one area where Defender falls short is in its controls which seem a little oversensitive, especially when you play with the faster ships later on. Placing your shots with the standard weapons from long-range is difficult because you have to shoot most of the Manti many times, with the more difficult ships requiring the most firepower. It's hard to focus on a single ship when they're swarming around you, but this focus is essential because most enemies will eventually succumb to your fire. Trying to take on all the Manti at once doesn't work. It's easier to kill them when you get closer, but with multiple enemies, it's a lot harder than it sounds. Waiting until you're in close sets you up for more damage. Targeting with the more advanced weapons is easier. The controls aren't as good as they could have been, but this can be compensated for with skill and experience. Once you get the hang of its interface, Defender becomes a much better game. 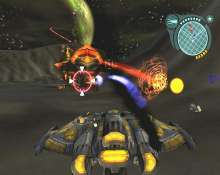 The original Defender had ground breaking visuals and dynamic explosions, and the PS2 edition carries this aesthetic heritage forward. Defender's overall design is excellent, with beautiful planet environments that are detailed with nicely rendered interstellar terrain. The worlds range from the desolate deserts of Mars, to Jupiter's frozen moons heading towards a final battle to reclaim the Earth itself. The Manti-aliens are brilliantly designed with an appropriately insectoid appearance and have appropriately creepy animations. As noted earlier, the game matches the intensity of the original game and the engine used is quite impressive, allowing for unrelenting action at every turn though it does suffer from a little bit of slowdown when numerous objects are onscreen. The onscreen map also helps by using different colored glowing auras the aliens, colonists and other objectives helps to keep you pointed in the right direction. This makes things easier to understand while also heightening the effect of feeling constantly under siege. 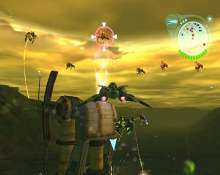 Flying around and suddenly seeing dozens of those green lights on the horizon heading towards you is quite ominous and adds the essential tension to the game. One cool touch is that this new version retains some of the original game's sound effects and supplanted these with some new classic sounding weapons as well. It's especially cool to hear the classic blaster sound and the original beeps when a hostage is taken by the Manti. This approach definitely adds a pleasing retro spin to what is otherwise a completely modern title. Defender also includes some pretty intense techno tracks from the likes of KMFDM and Trigger that fits in well with the unrelenting gameplay. Defender also includes some cool DVD-style extras including a look back at the original title and a behind the scenes sequence where you can view interviews with the developers. While Defender has the classic feel and spirit, make no mistake that this is a contemporary game, complete with elaborate cut-scenes and state-of-the-art graphics. Midway succeeded with last year's well-received Spy Hunter update, and this newest retro title sticks with that winning formula. Defender stays faithful to the original gameplay yet overlays new missions, abilities and weapons to make it feel much deeper than the original title. Fans of the classic game will enjoy the fast paced blasting, while new fans will appreciate the increased complexity and is one of the best space shooters around. The controls aren't perfect but Defender, is easily one of the best classic updates to come along in quite some time, and is highly recommended for fans of the original, and also younger players who may have missed the original but love space shooters.